How on earth are you? I hope this email finds you very well! I wanted to say Hi on this special day, Molly's 1st birthday!! She is having a fun filled day, with many treats! Can't believe she's a year old!! We adore her beyond words, she is a marvel and wonder. How are the rest of your kids?? I will send you a recent photo. She is beautiful. Also, her extra baby teeth were removed right after we last emailed. She still has funny crooked adult teeth, but they so add to her incredible charm, and make her all the more adorable. How's her mom and your sister doing in Calif.? Well I hope you are very good, I'm sure you are waiting for spring too!! It's been crazy! Do you have any litters on the way? Take good care, and let us know when you come down to NY. Finn is just about perfect and most are just a bit of puppy biting antics. So far he know how to sit, come, jump on his footstool and has had few accidents in the house. 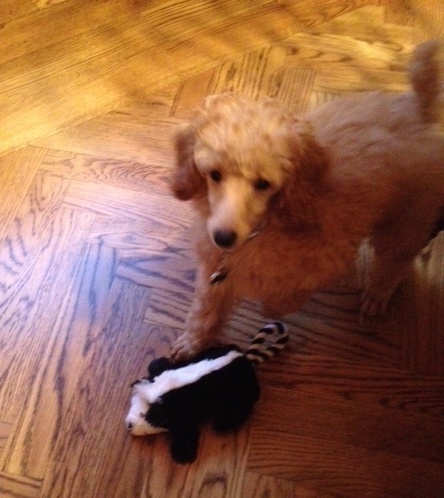 In fact, while still gated into the kitchen yesterday afternoon – he escaped from his crate. When I came home, no mess! And he had to go as he peed and pooped as soon as I took him out. He likes the shower and, in fact, insisted on joining me this morning – straight under the spray.. He is not shy at all – quite the opposite. He loves to explore. 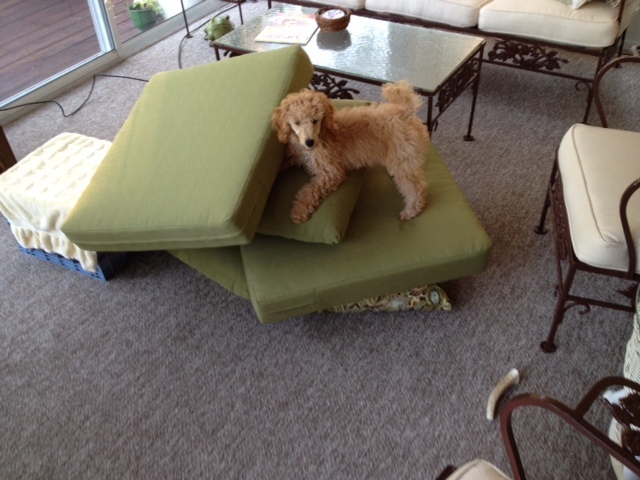 As you can see – he is king of the cushion mountain!! He is very handsome and very proud. He starts puppy kindergarten next week – but has meet a few dogs over the past few week and love the socialization – even the big chocolate lab!! 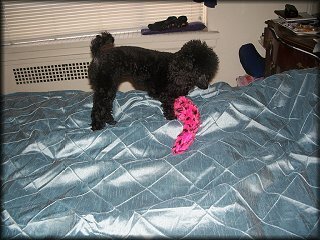 His favorite chew toy is the hoof that you provided – chews on that quite a bit! What a smart little sweet boy J and we love him dearly! I am as cute as can be, but love to make a little trouble. I love my new Mom and Dad and want to be with them constantly. This means that I howl and cry a lot during the night. It seems to work. They think I need to go potty and come and let me out several times during the night. During the day, I spend most of my time sleeping with my head on someone's foot. I've impressed Mom and Dad already because I know how to fetch a ball, come when called and have only had one accident in the house. This morning I played in the shower in the master bath, drank some water and batted about the shower spray. Next I decided that I would go surfing on the ironing board under the bed, but got a little scared when I couldn't find my way out under the dust ruffle. I have already knocked over the board in the kitchen and went down to the den to find Daddy - to his surprise. Heck, I even go up and down the uncarpeted stairs from the bedroom level to the foyer. 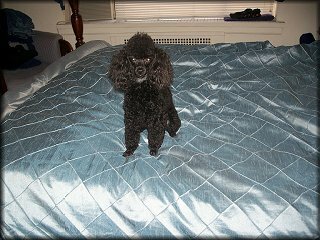 I have been working on jumping on the bed. I am not quite ready, but I am sure with a little more practice I will clear it. So far my technique has been mostly vertical, but this morning I decided to try for a running start and made a bit more progress. Today I am spending more time in the crate. Daddy and Mommy are determined to get a better night sleep tonight. I am being a better boy because I love them. I just want to have that human contact that started with my breeder mom, Barbara. PS – I can hop like a bunny when I need to pounce, I can prance like a rain deer in a truly regal poodle fashion and I can point like the best hunting dog around. I can’t wait to pull out a few more tricks. We were thinking of you and wondering how you are. We hope this finds you well and all your sweetie pies happy and healthy. Alfie turned 5 June 25th ! I can't believe it, the time flies by. He is our handsome boy. Not toooo spoiled, ha ha. He is so sweet. Very empathetic doggie. He knows and understands so much, so smart. We love him so much. We often talk about how he came to be a part of our family, and Alex talks about picking him out with you and the drive back to Virginia with Alfie in the cat crate. I was sick then and when Alex got home, it was like Alfie was a instant fit, he just adjusted so well. He is sitting on the chaise right now looking at me, he knows I'm bragging about him. We will always thank you for our sweet Alfie. My name is Paul Fariello. You may remember me (I don't know how many long-haired rock musicians you've sold an apricot mini poodle to? 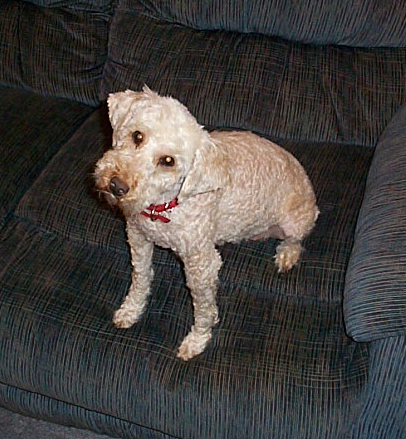 ), I bought "Bailey" in 1999. She was born February 6th, and I brought her home on April 6th (my 34th birthday). Bailey had to be put down last month. It's truly the most devastating loss of my life. It's through the grieving process that I found your website again. Through the "Rainbow Bridge" section. 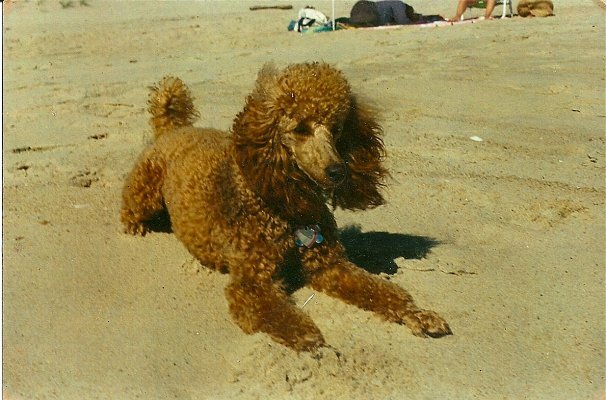 I was very happy to see that you are still breeding poodles as you are truly gifted. 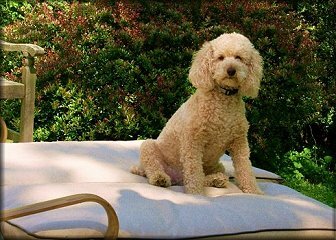 I know nothing about breeding dogs, but all I can say is that the qualities that you strive for in your poodles could not be exemplified any greater than in Bailey. 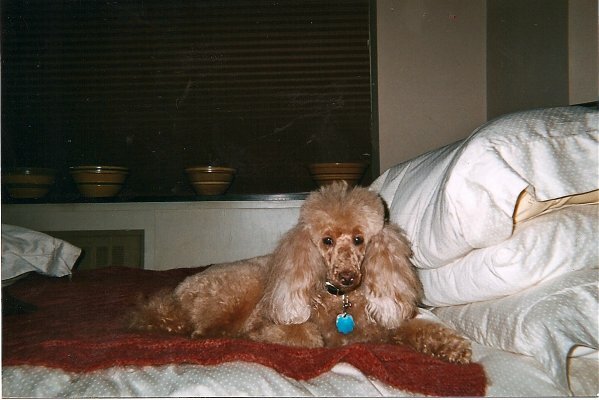 She was the most sensitive, happy, sweet, playful, and loving dog I could have ever imagined. 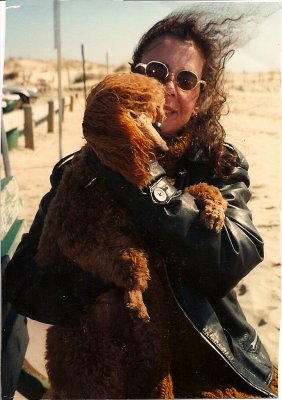 My vet always commented on her wonderful temperament. 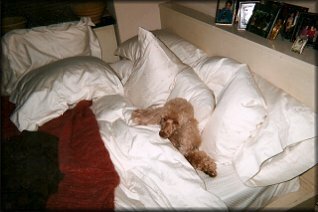 When strangers would ask if she bites, I would say that I would confidently put Bailey in a crib with a baby covered in Alpo, knowing that the only danger was the baby being licked to death (if that's possible). She was my first dog which is why this is so tough. 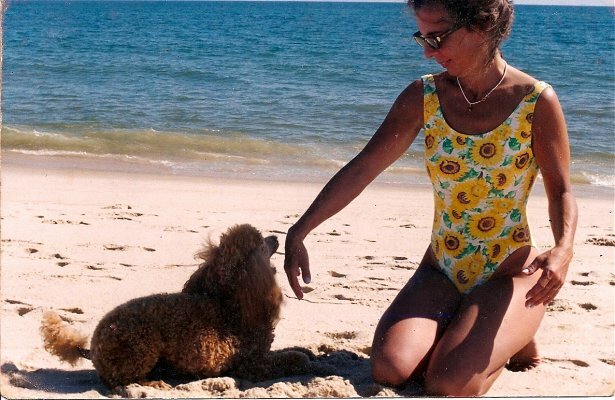 My parents had a dog that passed away when I was a small child, but I never bonded with her like with Bailey. I named Bailey, fed her, walked her, played with her, took her to the doctor. She became so interwoven into the fabric of my life. Which is even more apparent now that the house is so horribly silent. I know this is nothing new to you. I imagine you've gone through this many times. I guess I just wanted you to know how much she meant to me, and to thank you for what you do. You gave me the best little friend anyone could ever hope for. I can say with absolute certainty, that I am a better human being today, because of the twelve wonderful years that I had the good fortune of being Bailey's daddy. I'm thinking about getting another dog. I've read a lot of stuff about not getting another dog too soon, or the same breed, etc... The thought of one of Bailey's relatives is very appealing. I'm still trying to sort it all out, but I'd definitely like to talk to you when I'm ready. Again, I can't thank you enough. I'm sure I'm only one of countless people who's lives you've made better because of your efforts. Just wanted you to know that we are really enjoying Crosby. The feeling is very mutual from him as well. He has adjusted very well. Below are a few pictures taken the first day we brought him home. 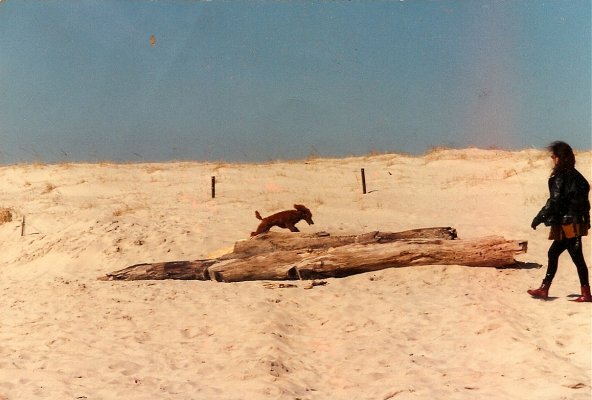 A wonderful collection of photos of Peggy Sue. Just wanted to share some pictures with you of our girl Peggy Sue. Thank you so much for breeding her. Anyone who bred Peggy Sue is #1 breeder in the world. She is the love of my life. As you can see from the pictures how precious and beautiful she is. She is a city girl. I get stopped all day long and they want to know who you are. 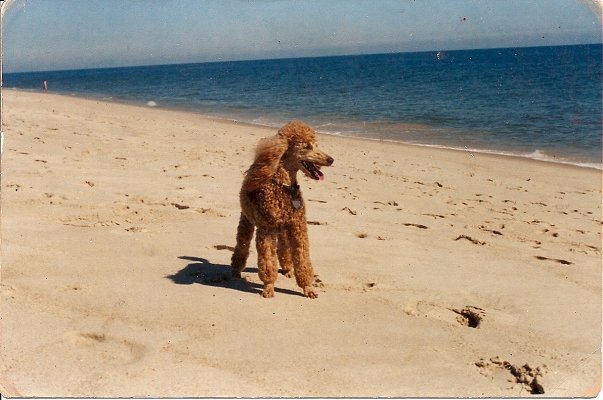 The pictures of Peg on the beach is in Amagansett, LI. She was about 3 - 4 yrs. One day Peg had a hard day shopping so when she got home she needed a nap. 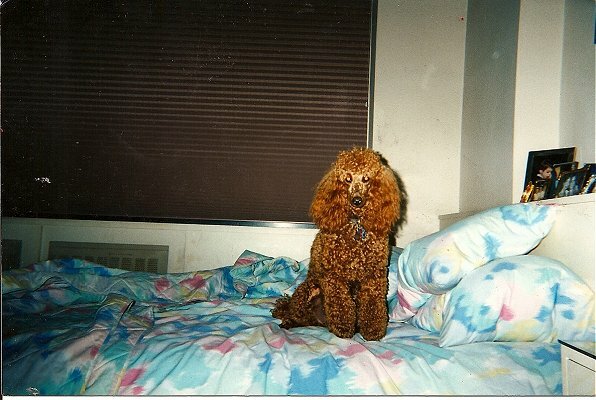 The first picture is Peggy Sue, just groomed at the young age of 13. Perfect happy and beautiful. Thank you again for giving her to me. My life is so much more fulfilled. 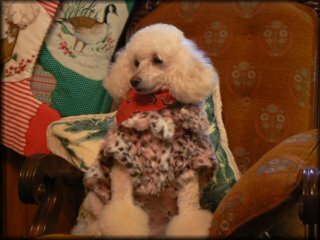 We have a FABULOUS groomer in Abington, Pa. We drop her off there, go to the Mall, pick her up & go home and she always looks wonderful, as did our Rosie and our Itty Bitty Madison. The best part of it is that she LOVES our babies. They're HER babies too. We got them from her and she is the only breeder we'd ever consider. She acts tough when she sees Misty but we see her sneaking kisses to her! She always gave kisses to our babies because she loves them. We wouldn't leave our Misty with anyone but Barbara. No way! She gets the best haircut and a cute neck collar but most of all, she gets LOVE from Barbara! She is our first and only choice. 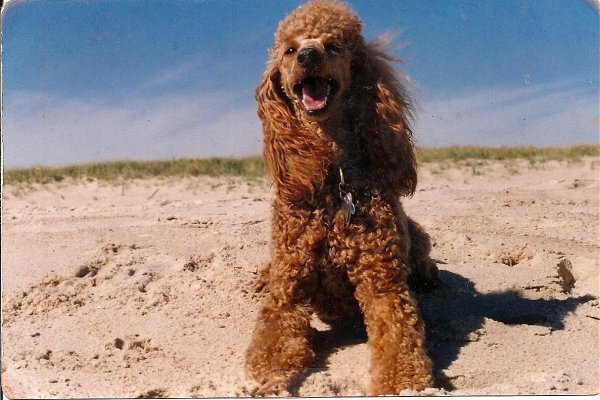 I am writing to let you know that my beautifully handsome Jonas passed the AKC Canine Good Citizen test last night. He is a magnificent representative of his breed, but we knew that from day one. He is also incredibly smart, but you knew it before I did and you were so right. 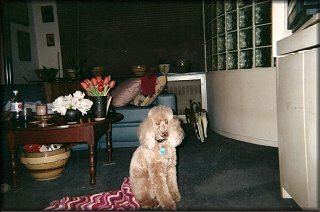 It had been a couple of years since I had taken Jonas to obedience classes, and this spring Pam Krieger mentioned classes sponsored by the Pocono Mountain Kennel Club. 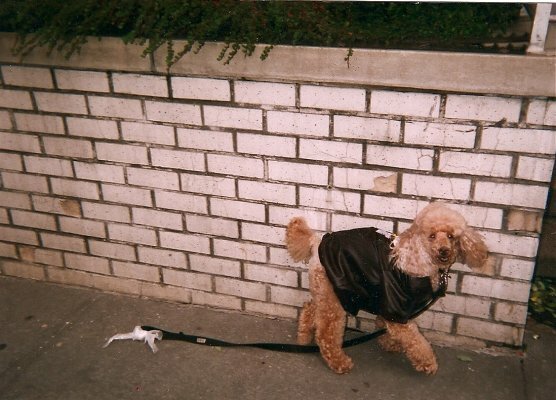 I thought that it would be good for him to socialize more with other dogs & their owners. I can't tell you how great the experience has been, both for him and me, nor which of us enjoys it more! It isn't possible to truly convey to you how much I love my dog, how proud I am to have him in my life and, finally, how grateful I am to you for the gift that is Jonas. I trust you are well, and hope we meet at a show sometime. UPDATE: Jonas now how is own page in the Beauty & Brains section of the site. Way to go Jonas! Hope you have a wonderful New Year! Here's a picture of Lilly, now six. She's wearing her faux fur Christmas coat. As you can see, she's the queen. Pam Kieffer.